I like winter. But only when everything is covered in snow, the sky is crystal blue and I’ve got a hot chocolate. Well… this is pretty rare! At least where I live. Our winters are more like rainy, gray, and dreary, so I should better stop day-dreaming about snow-covered mountains and frozen lakes. I mean there is snow, but it just doesn’t happen very often. But on the plus side this rainy weather is perfect for hearty soups and stews! The other day we had this vegan potato kale soup, which was not only really warming but also super delicious and healthy! 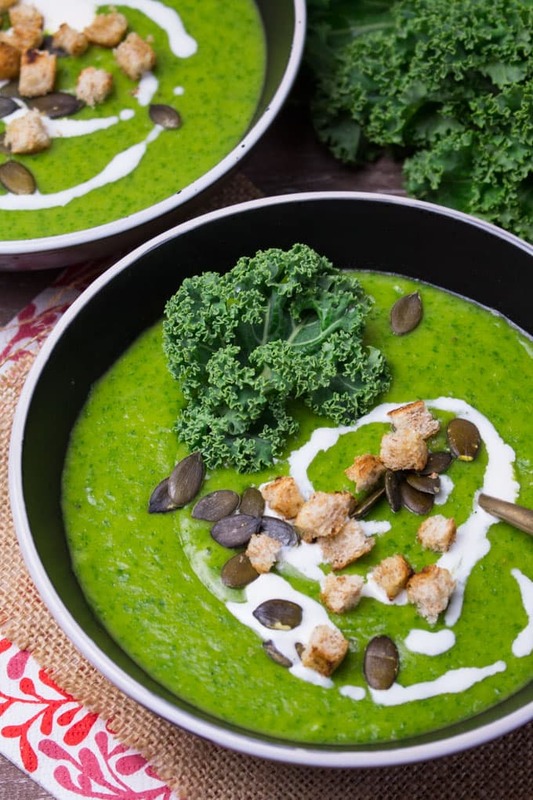 You wouldn’t guess how many veggies are in this soup! Besides kale and potatoes, I also smuggled in some carrots, celery, and leek. 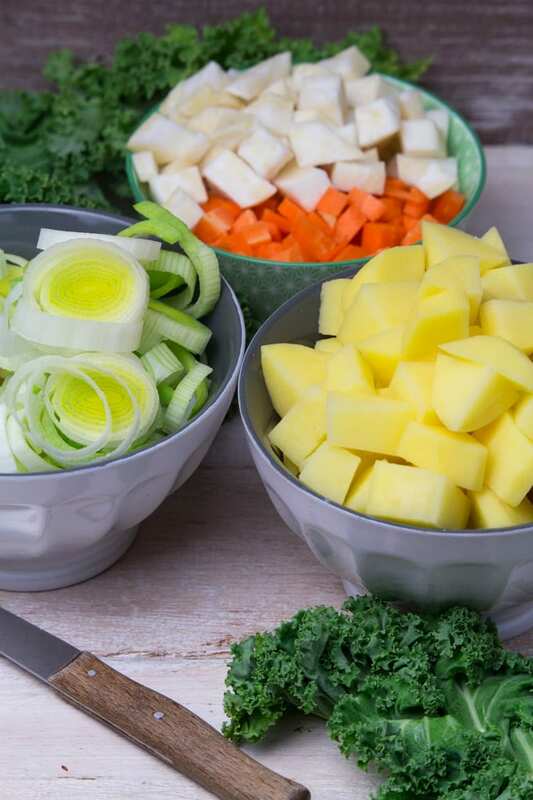 At first, I planned to make a simple vegetable soup with all of these fresh veggies, but then I changed my mind and blended it into a creamy soup. And I’m so glad I did! It turned out soooo creamy and velvety! For the topping, I used roasted pumpkin seeds, homemade croutons, and some soy cuisine. If you want a soy-free version, you can also use oat cuisine instead, which works just as good. For the homemade croutons I cut some whole wheat toast into small cubes, heated a teaspoon of vegan margarine in a small pan, and roasted them until they were crispy and golden. I still can’t believe it’s only 10 more days till Christmas! I just got the first couple of presents today and I really need to start baking some more Christmas cookies! I hope you all have an awesome week and maybe you even got some snow that goes well with this vegan kale soup! 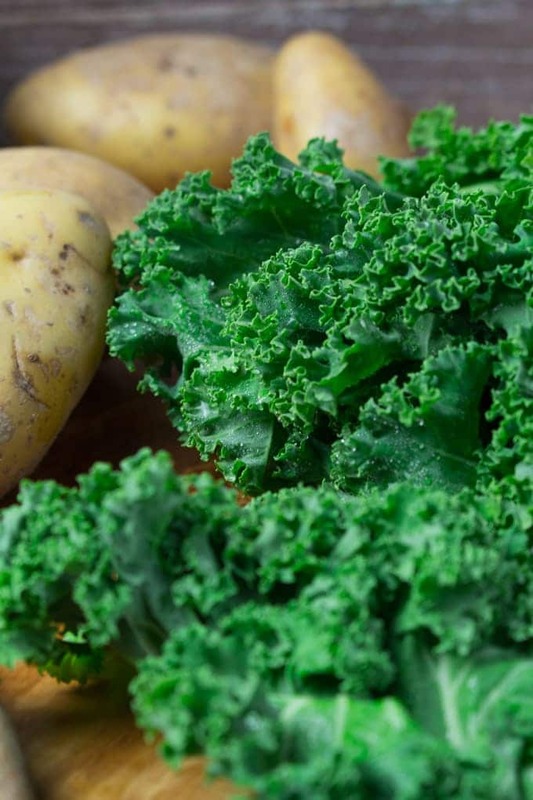 This vegan potato kale soup does not only look really fancy, but it's also super delicious and packed with nutrients! Just perfect for Christmas! In a large pot, heat some olive oil and sauté the onion for about 2 minutes. Then add the garlic and sauté for another minute. Stir in the potatoes, carrots, celery, and leek. Cook for 3 minutes. Then add the vegetable broth and cook for 15 minutes. In the meantime, make the homemade croutons. 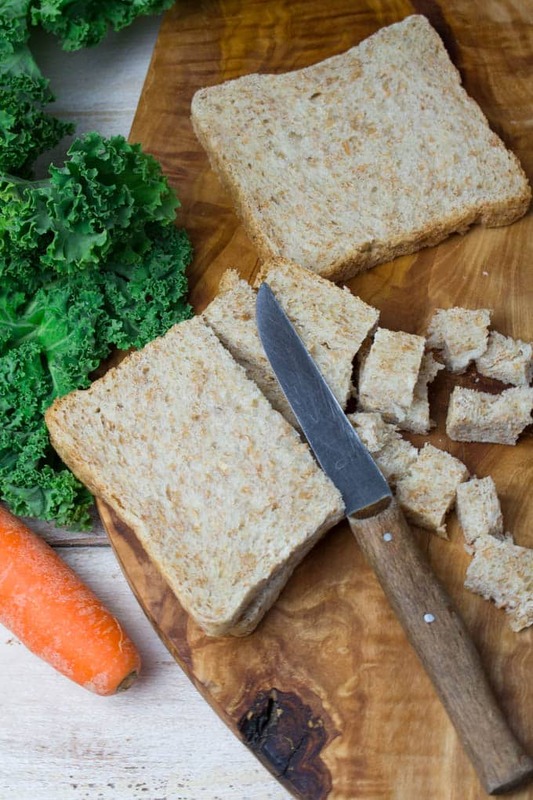 Cut the whole wheat toast into small cubes. Heat the vegan margarine in a small pan and roast the toast cubes for about 3 minutes until they're crispy and golden. Set aside. 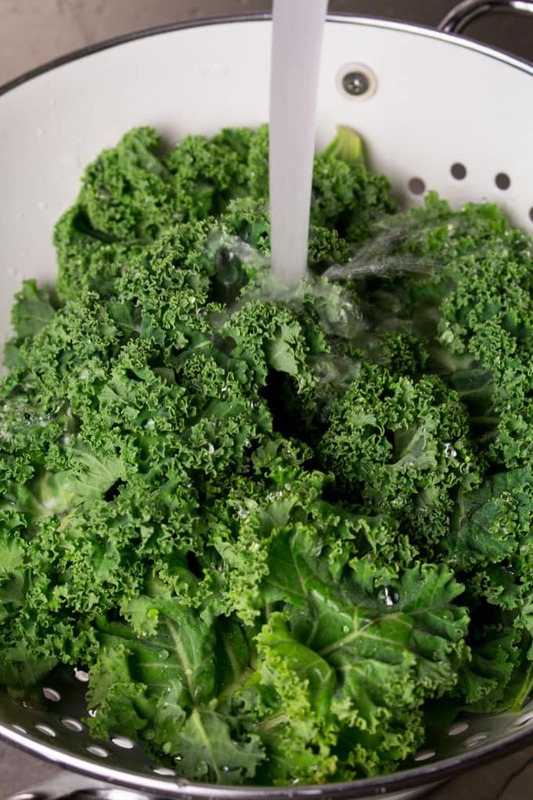 After the soup has cooked for about 15 minutes, add the kale and cook for another 2 minutes. Season with salt and pepper and blend until creamy. If you want the soup to be thinner, add some more vegetable broth. Top the soup off with soy or oat cuisine and sprinkle it with roasted pumpkin seeds and homemade croutons. What a gorgeous green color! And I love all the delicious veggies in there to give it flavor. Delicious! Is soy/oat cuisine the yogurt looking stuff on top? I’ve never heard of that before. 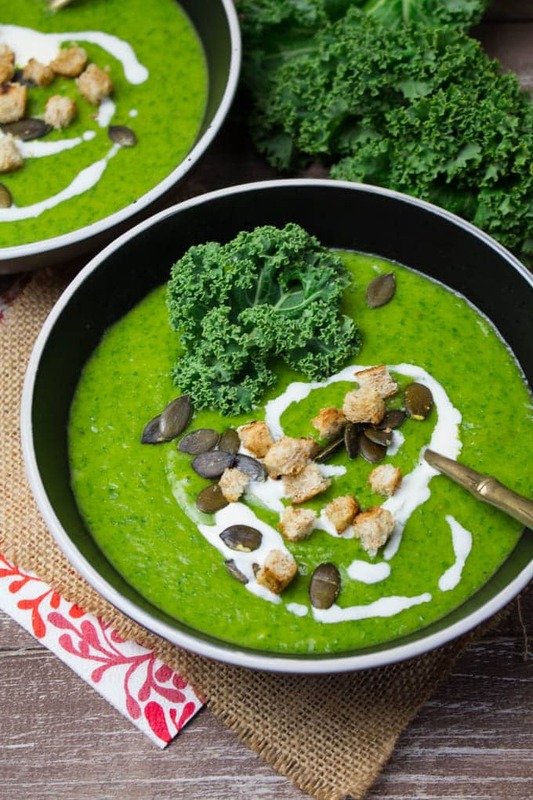 Hi – my daughter and I just made this soup and it tastes delicious! Our color isn’t as gorgeously bright green, though. Do you have any tips? Thanks! You are right, I would not have guess how many veggies you packed into one beautiful soup! I think “Hulk Soup” would be a pretty appropriate name, but I have to admit the word “potato” in the title is one of the main things that drew me in. I LOVE potato in soup, throw in any and all veggies, as long as there is creamy potato then I am on board! Haha! I’ll let my boyfriend now that the name he came up with actually wasn’t that bad after all, Natalie! ;-) I totally agree with you, creamy potato soups are so delicious! It’s so green it’s perfect!!!! That is a crazy awesome bowl of health and yum! That green looks amazing – totally love all of these ingredients too. Yummy! Thanks, Trinity! :-) Glad you like it! This soup is just GORGEOUS Sina!! Seriously, the color is out of this world and I love all the ingredients you chose! Most beautiful soup ever! Kind of looks like a vibrant park in the top view shots :) Love it. Such a vivid green colour! I love it. 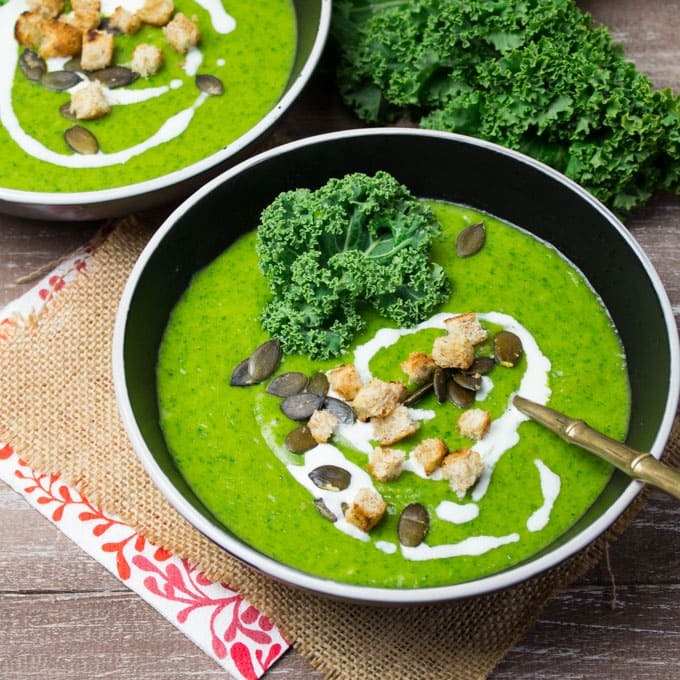 So healthy and full of flavour too.I could eat a bowl of this soup right now! Thanks, Mel! :-) Glad you like it! Haha! 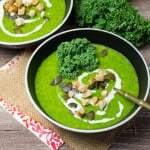 I love the name, “Hulk Soup.” This is so healthy, creamy, and gorgeous. The color is stunning! I guess this name would be so great for kids, wouldn’t it? :-) Thanks, Linda! I also LOVE the name HULK Soup! Maybe I’ll call it that to get my kids to try it. It does look and sound amazing. And the colors,,,,,,so vibrant. Look at that color! Amazing! And so many great flavors. Nice job! I love your food styling! You’ve made a simple soup into a gourmet delight! I love the color!! I could so go for a big bowl of this right now. It looks so fresh and lively! Everything about that soup says yummy!! The color, the ingredients, the toppings…I could go on and on but instead I am heading to the grocery store to buy all those ingredients and enjoy it this evening. Thanks for sharing and happy holidays! Thanks, Nancy! I hope you enjoyed it! :-) Happy New Year!! 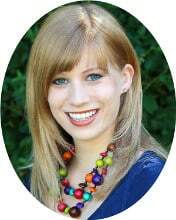 I stumbled across your blog today, picked a half-dozen recipes for the remainder of this week, and intend on checking back many times in the future. I’m curious, in the recipe your call for celery, but in the picture the root is pictured, not the stalks. Typically, and perhaps this is a US thing, I’m accustomed when a recipe calls for celery, that it means the stalks. 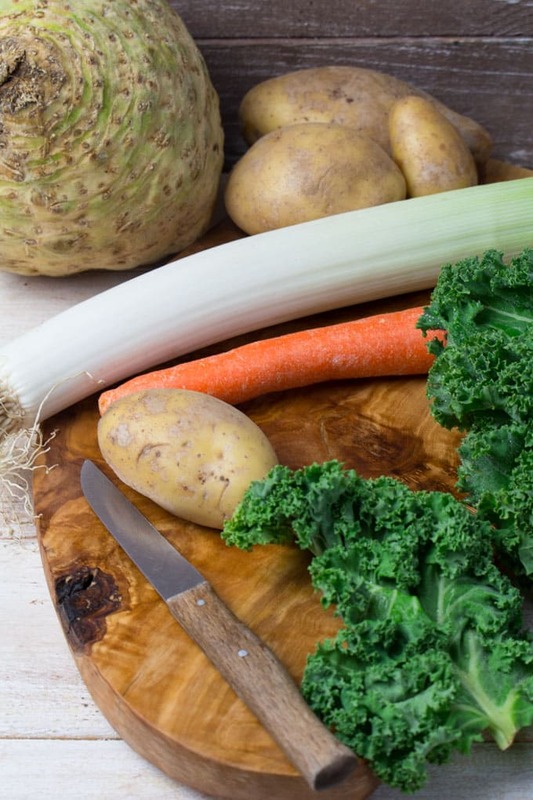 I just want to clarify that in this recipe I should be using the root, and also, going forward, when you call for celery in future recipes, how to differentiate from the two? Perhaps you say “celery stalk”? Thank you. Your recipes look and sound so fantastic, I just want to make sure I nail them! Cheers, and Happy New Year! That’s so great to hear! So glad you like my recipes. :-) Oh yeah, I must admit that really is a bit confusing. Usually I use the stalks too. I just checked my recipes again and this is actually the only one calling for the root. I haven’t tried this soup with celery stalk yet, but I guess this would be fine as well. Although it has a different texture and the root has a milder taste, so I’d probably prefer it they way it is. I had one of these huge roots in my fridge (we made celery “schnitzel” with it – I don’t know if you’ve ever heard of this? ), so this is why it ended up in the soup and it worked out really well. :-) Let me know if you give it a try or if you have any other questions. :-) Oh, and Happy New Year!! I made this soup today, but used half potato and half sweet potato. It is absolutely delicious! Unfortunately, the color changes with the new addition and looks more like pumpkin with green flakes than the vibrant green in your photo. I would definitely make it again! Yeah, chiming in to say that this soup was awesome! I made it last night and am excited for the leftover tonight. One difference that I wanted to recommend to any other people scanning comments before cooking was just to add some sprinkles of ground sage in with the vegetables when they’re first added (after onions/garlic, before broth) as a base aromatic. I may be biased because I just really love cooking with sage, but it added another subtle layer to the flavor that certainly seemed welcomed to my tongue. I am Vegan and going to make this soup, with only a couple of changes. I am turned off by what looks like swirls of sour cream which is not vegan. 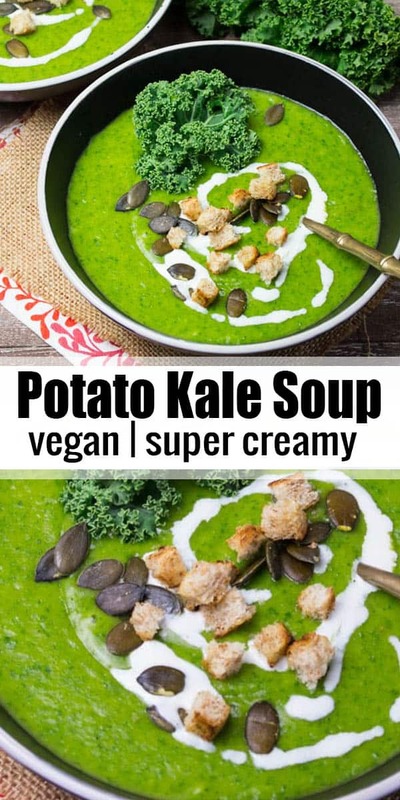 Hi Kanani, As all the recipes on Vegan Heaven, this potato kale soup is 100 % vegan. The white swirl on top is vegan cream (soy). Can I substitute the white potato for sweet potatoes? Hi Maggie, I haven’t tried this yet, but I think this could be pretty good. :-) Let me know how it turned out. Beautiful soup and pictures. The green color is amazing. So vibrant. I’m gonna have to try this one. My soup looks NOTHING like this green color, but it is amazing! It reminds me of brocolli cheese soup, oddly wirh neither ingredient. It is so delish, It’s in my save list!